A collection of verses and chants for children, Atukwei Okai has put together poetry and illustrations which reminds you of childhood stories as told by grandparents, uncles, aunties and older family members. If his aim was to take parents back in time and remind children about what it means to be a child being raised by a community, his poetry which have lessons embedded in them has succeed. 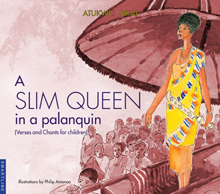 “The tall biog trees in our forest, I salute, For the beautiful things they contribute: The desk and the bed and the door and the chair…” A simple yet effective form of writing for children means the message hits home and Okai’s book are a good way to introduce children to reading poetry and keeping their attention. This entry was posted on Friday, September 21st, 2012 at 4:39 am	and is filed under Africa, African Diaspora, Art and Culture, Book Reviews, Journalism. You can follow any responses to this entry through the RSS 2.0 feed. You can leave a response, or trackback from your own site.